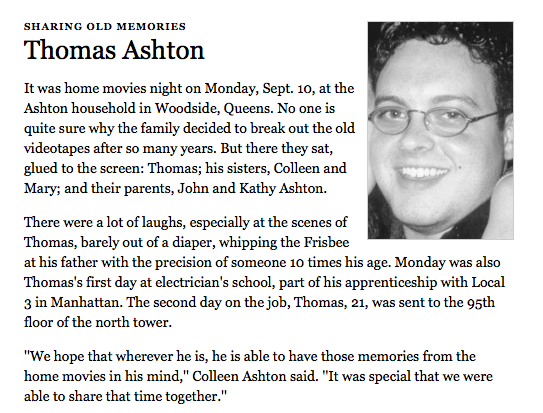 My cousin Tommy Ashton was murdered in the 9/11 attacks on the World Trade Center. Since then, Tommy’s sisters Colleen and Mary have shepherded the Thomas Ashton Foundation, which has an annual 3-on-3 Basketball Tournament and has donated over $285,000 to worthily charitable organizations and local projects (list of recipients here). Next month will see the final Tommy Ashton 3-on-3 Basketball Tournament at St. Sebastian Parish Center in Woodside, Queens, where the Ashtons have long resided. It’s a great story. Here’s hoping one of the Big Town dailies picks it up. This entry was posted in Uncategorized and tagged 9/11, Colleen Ashton, John Ashton, Kathy Ashton, Mary Ashton, New York Times, North Tower, Portraits of Grief, Queens, St. Sebastian Parish Center, Thomas Ashton, Thomas Ashton Foundation, Woodside, World Trade Center. Bookmark the permalink.